I don’t know about you, but I’m definitely a fan of firm tofu. It’s an easy, meat-free protein that doesn’t really have a taste; rather, it takes on the flavor of whatever you cook it with. My absolute favorite way to eat tofu is in Asian stir-frys. The Thai restaurant a few blocks away makes a killer Pad Thai with tofu (I bet it’s really good with chicken or shrimp too, but i’m a creature of habit when it comes to ordering take-out). I think the key to making really delicious tofu is crisping it up a bit before you add it to the rest of the dish that you’ll be serving it with. Caitlin at the Healthy Tipping Point has a great way to make crisped-up tofu…thus when I made this recipe, I found the steps to be very similar. In a small bowl, whisk together all ingredients for the sauce. Set aside. Dredge the tofu cubes in cornstarch & shake off any excess. In a large pan, heat the oil over medium-high heat. Place the tofu into the hot oil, browning each side. Once all is nice and crispy, transfer the tofu to a paper towel & set aside. Lower the heat in the pan. Once the temperature has dropped a bit, add the sauce and cook for about 30 seconds. Add the tofu back in and toss to coat. Serve atop of rice with some veggies (I recommend sesame carrots or snow peas). 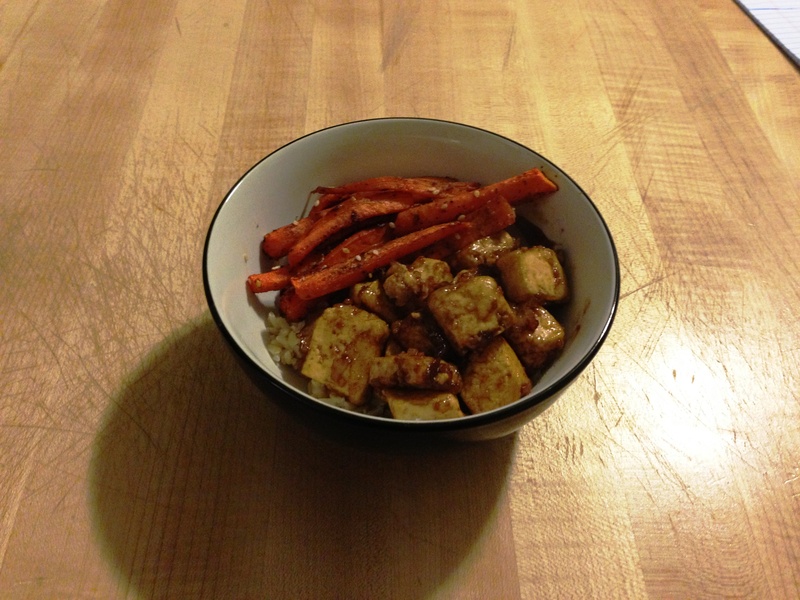 Crispy Honey-Soy Tofu with sesame carrots & brown rice. The flavor of the sauce that you coat the tofu with is amazing. The garlic, ginger & lime are a great combination with the soy, and the honey adds a really nice sweetness to it. As I said before, I browned the tofu in coconut oil – this added a bit more sweetness and depth to the meal and I was very impressed with how it turned out. The carrots were made with sesame-chili oil, sesame seeds, and the Bangkok Blend seasoning from Penzey’s Spices. Great heat and great flavor. I didn’t even need to add sriracha to my dish – can you believe it?! I feel as though this is the quintessential Asian stir fry flavor that I have been in search of for a very long time. If you’re a tofu fan, I think you’ll really like this dish. If you’ve never tried tofu, trust me – try this dish! You won’t be disappointed. Hi Jenny, thanks for linking to my recipe. It’s one of my favorites! The sauce is seriously addictive right?! No problem! Credit where credit is due 🙂 It’s very, very addictive! Can’t wait to try it with chicken or beef, too. It’s wonderful!